E-Learning 24/7 Gives Litmos LMS Thumbs Up! Home ELearning Industry NewsE-Learning 24/7 Gives Litmos LMS Thumbs Up! Home › Blog › E-Learning 24/7 Gives Litmos LMS Thumbs Up! 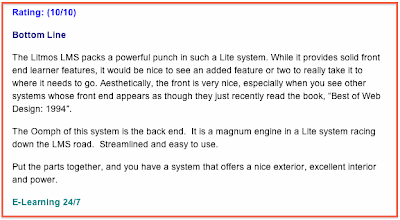 On April 9, 2011 Craig Weiss of E-Learning 24/7 posted up a product review of the Litmos LMS on his website. I have to admit, I was a little nervous to read it as I've followed his blog for a while now and know just how tough a critic he can be. 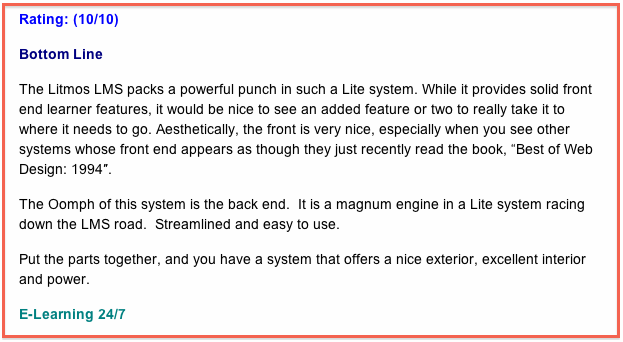 I was hoping that he liked using Litmos, of course, but more than that we were looking forward to some constructive, 'no holds barred' feedback from an industry leader who has tested and reviewed so many of the LMSs out there. Well, I'm very pleased to say that the admin side of our system was reviewed and received a whopping 10/10! The learner side received a slightly lower 7/10 but we knew there was room for improvement there. In fact, that is exactly why our next upgrade in June 2011 includes many enhancements to the learner side UI and functionality. Hopefully, we'll be able to convince Craig to take another look to see if we can bring that 7 up a few notches! Please do check out the full review and if you have any questions at all just ask us. For more commentary on the eLearning industry, products, and events follow Craig Weiss here on twitter @diegoinstudio.